Search Engine Optimisation, commonly referred to as SEO, is the process of maximising the number of visitors to your business website by increasing it's position within organic search engine results. In other words, it's working to make sure your business is one of the first to appear when people come looking for your products or services. Here's what it looks like in practice when using Google. 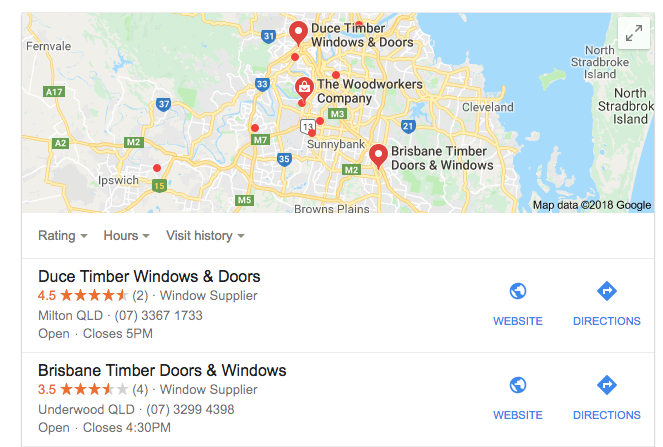 1) A user looking for timber windows for their home renovation near Brisbane searches for 'timber window suppliers brisbane'. 2) Google displays results based on the user's search query. Some results are paid advertisements, and some are Google's organic results. The goal of SEO for a local business is to work to ensure your business appears as high as possible within the Google's Organic Local Pack Results as well as Google's Organic Search Results. With over 200 different ranking factors affecting your position within the organic search results, it's important to know where to focus your energy. We understand the most important factors that drive each result set (local pack results and search results) and are able to invest time and energy developing the elements that make the biggest impact. For example, reviews play a more important role within the local pack results than the search results. So if we want to rank your business higher within the local pack results, we work with you to establish an online review capture framework for your business. By understanding the key factors that drive each result set, we're able to analyse the competitive environment of your business and put strategies in place to help you beat your competition.